Saudi Arabia’s King Abdullah bin Abdulaziz is reported to be clinically dead as the monarch is not recently seen in the public. ED Noor: Gosh, I am so sad. I imagine you are too, dear Reader! Chortle. A Saudi journalist working for London-Based Asharq Alawsat says the Saudi monarch has been clinically dead since Wednesday. He also quoted medical sources in Saudi Arabia as saying that the king’s vital organs, including his heart, kidneys and lungs, have stopped functioning. Doctors are said to have used a defibrillator on him several times. He is also reported to be alive with the help of a ventilator. The Royal Court has yet to comment on the report of King's death. The aging Saudi monarch has not recently appeared in the public and the country's crown prince is attending official meetings on his behalf. It is the second time in the past months that Asharq Alawsat reports the death of King Abdullah. 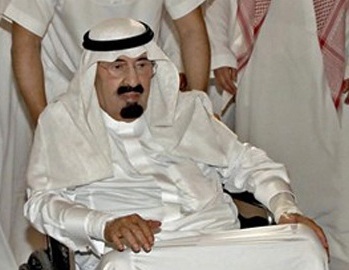 In November 2012, the daily reported that Saudi king has slipped into coma and was clinically dead nearly a week after he underwent a 14-hour-long back surgery in a hospital in the Saudi capital, Riyadh. The report was later rejected by the Royal Court. The 89-year-old king’s health has declined over the past few years, during which he has been hospitalized several times. Failing health, old age as well as the death of the king’s half-brothers have raised concerns about the future of the oil-rich country in the face of anti-government demonstrations. does this mean a resurrected Bandar could ride in on a white horse.....from points west ? and where is the TEAM SPIRIT those zionist cheerleaders in DC planned for the awahahabi's...?